Join Emma from Greenstuff Nutrition in this fun interactive session for children and their carers. 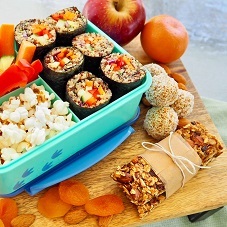 You will learn about and make a range of healthy goodies ideal for the lunch box including Apricot Bliss Balls, Muesli bars and Sushi rolls. Note: Participants to wear apron, closed in-shoes, long hair tied back.